Among the numerous highlights of our March 2018 Baltimore Auction is lot 3102, an extremely rare Louis d’Or countermarked by Ephraim Brasher of Brasher Doubloon fame. Brasher worked as a gold and silversmith in New York following the evacuation of the British Army on November 25, 1783. A good friend and neighbor of then-General George Washington, he quickly gained the confidence of regional merchants and became perhaps the most prolific regulator of the era. His unmistakable “EB” touch mark is now associated with an exclusive and mythical realm of numismatics, and the present piece is among the most elusive representatives bearing the Brasher mark. The EB counterstamp is nicely centered over King Louis XV’s portrait, rendered on top of Brasher’s own regulating plug. The surfaces are bright and glossy in most areas from time cherished as jewelry, with a hole apparent at 12 o’clock that has been plugged and re-engraved. Similarly, the central, regulating plug has also been re-engraved on the reverse. Though the plug at the rim was added long after Brasher made his adjustment, this specimen’s current weight of 123.9 grains is still aligned to the 5 dwt, 4 grains (124 grains) standard that Brasher would have been regulating to. This standard was established by the Bank of New York in May 1784, which dictated that “French Guinea(s)”, or Louis d’Ors, would be received and paid out at a weight of 5 dwt, 4 grains with a value of $4.52, not the $4 2/3 as stated on the current PCGS label. 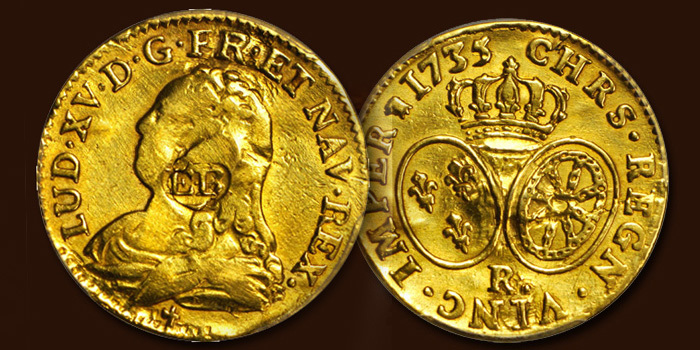 This valuation would continue to be the accepted rate up through the establishment of the U.S. Mint, with the Congressional Act of February 9, 1793, calling for “the gold coins of France, Spain and the dominions of Spain [to be valued] at the rate of one hundred cents for every twenty-seven grains and two-fifths of a grain.” When calculated out, we see that this is virtually the same standard established by the Bank of New York a decade earlier. 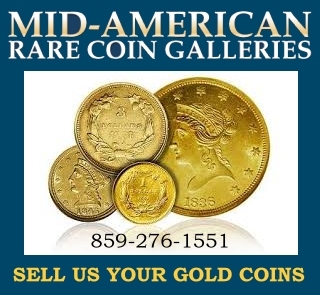 The U.S. Mint would not strike its own gold coinage for circulation until 1795, and the acceptance of foreign gold coins like the Louis d’Or was a crucial element of the growth in the early American economy. Regulators like Brasher were essential in the maintenance of this haphazard monetary system, and the present piece is a significant relic of this foundational era. Brasher marks on French coinage are extremely rare, with only a few examples known. Specialist Ralph Gordon makes mention of just one known French Louis d’Or with the Brasher stamp in his 1987 reference West Indies Countermarked Gold Coins, which could be an allusion to this very piece. When offered at the ANA Auction of August 1983, this specimen was cataloged as “possibly unique” and “the only French coin countermarked by…Brasher known to numismatists today.” It was more recently featured as part of the incredible Edward Roehrs Collection in August 2010 and was, remarkably, the only French counterstamped piece therein. With its tremendous array of exciting material spanning U.S. numismatics, our March 2018 Official Auction of the Whitman Coin & Collectibles Expo delivers a dynamic selection of rarities. This incredible Ephraim Brasher-stamped Louis d’Or in lot 3102 accompanies such highlights as a near-Gem 1958 Doubled Die Obverse Lincoln Cent in lot 2146 and the magnificent Proof-63 Cameo (PCGS) 1879 Quintuple Stella from the Garrett Collection in lot 2272. The sale is available for viewing and bidding in its entirety online at www.StacksBowers.com. Also, download our mobile app to view and participate in our exciting auctions via your Android or Apple device.